When you hear the word “Revolution” what comes to mind? Harmony? Growth? Careful planning? Learned wisdom? No – not at all. You think about tension. Painful change. Upheaval. Bloodshed. Bodies by the side of the road. Management teams embark on a Revolution when they begin thinking about bringing an Enterprise Resource Planning (ERP) system into their company. Often, a team starts thinking about an ERP system because it is the only alternative they know. They’re not to be blamed as the marketing engine behind the ERP systems are VERY well oiled machines; oiled with gross profits. A management team standing on the precipice of this decision has been feeling lots of pain. Pain in gathering all of the data to do month-end and year-end work; the pain of limited or no central visibility into all the systems that have grown inside of their company over the years; pain from the lack of information available to correlate and properly steer their business; the pain in being unable to quickly answer delivery Service Level Agreement (SLA) question on strategic new customers and sales. The list is long and painful. They stand at that precipice with seemingly only two options. 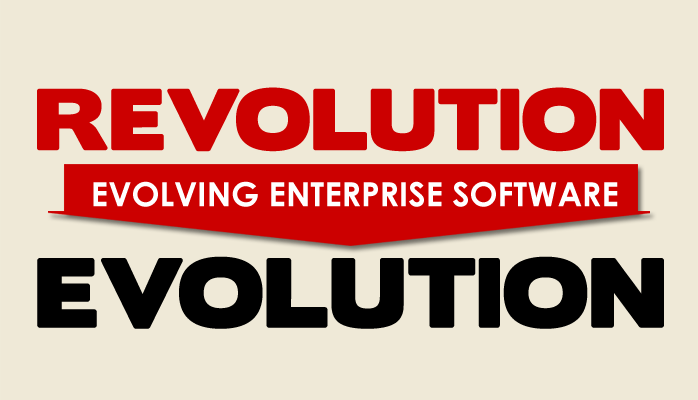 The path they’ve travelled, and the revolutionary path of an ERP. Neither is appealing. DECK DecisionWare is an alternative that is evolutionary for a business. We’ve built DECK DecisionWare based on the wisdom of how financial institutions (banks) approach their information infrastructure. All of the information systems in the ecosystem of a bank need to communicate together to give the management, employees, customers and investors the visibility they need in a timely fashion. Financial institutions figured out a long time ago that these systems will be around for a long time. Some systems will exist for 15 years or more. But at some point, they will get old and need to be changed out for new ones. They CANNOT afford a bloody & costly revolution every 15 years. The body of a bank, like any business, is an ecosystem where all the appendages communicate back to a central vantage point. The management team uses that vantage point to drive the business. Unlike a human body, at some point an appendage needs to be scheduled for replacement. The requirements are gathered, options investigated, the path defined, the new system is bought or built, implemented, hooked into the body, and then the old system is turned off. The trick banks have discovered is to be able to create an interface between the body and the appendage. When it comes time for a replacement, that well defined interface allows the new system to connect seamlessly to the body, and the old system turned off and thrown overboard. Connect to the systems you have now into one well functioning ecosystem. Get information from the entire ecosystem with minimal manual data collection effort, and easy visualization with graphs, charts and reports. Strategically, as needed, obsolete systems that are no longer performing in the current business environment for new ones that can do the job. The management team can now properly guide the business from this vantage point. Most SME’s pick an ERP system simply to get visibility into all parts of the business. DECK DecisionWare gives a management team an alternative. How much better would you sleep at night if your management team wasn’t being forced into a revolution? The evolutionary path is right here. Fascinating! This has huge utility for virtually all levels of business. Thanks for the comment, Clare! Yes, we’ve certainly found that it is a game changer for a business!